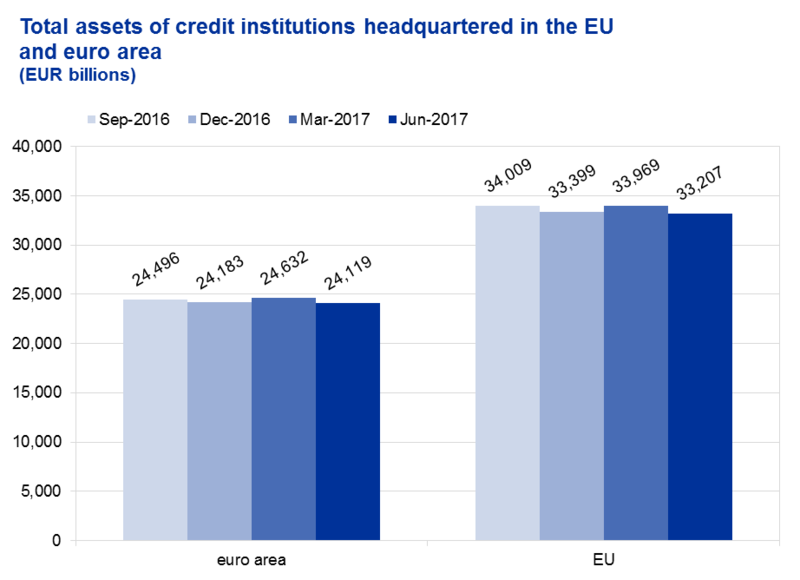 The number of credit institutions headquartered in the EU decreased from 3,153 in March 2017 to 3,124 in June 2017. Total assets of these credit institutions decreased by 2.2%, from €33.97 trillion in 2017Q1 to €33.21 trillion in 2017Q2. The European Central Bank (ECB) has published the Consolidated Banking Data (CBD) with reference to end-June 2017, a data set of the European Union (EU) banking system compiled on a group consolidated basis. The quarterly CBD cover relevant information required for the analysis of the EU banking sector, as a subset of the information available in the end-year dataset. 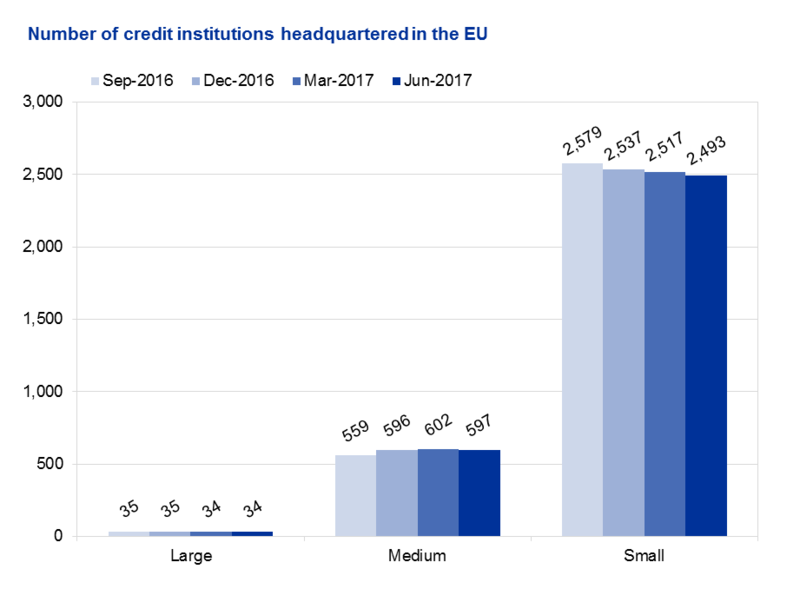 The end-June 2017 data refer to 337 banking groups and 3,063 stand-alone credit institutions operating in the EU (including foreign subsidiaries and branches), covering nearly 100% of the EU banking sector balance sheet. This dataset includes an extensive range of indicators on profitability and efficiency, balance sheets, liquidity and funding, asset quality, asset encumbrance, capital adequacy and solvency. Aggregates and indicators are published for the full sample of the banking industry. Large reporters apply International Financial Reporting Standards and the European Banking Authority (EBA) Implementing Technical Standards (ITS) on supervisory reporting, while smaller reporters may apply national accounting standards. Accordingly, aggregates and indicators also cover data based on national accounting standards, depending on the availability of the underlying items. Together with end-June 2017 data a few revisions to past data are disclosed. For media queries, please contact Stefan Ruhkamp, tel. : +49 69 1344 5057. The Consolidated Banking Data are available in the ECB Statistical Data Warehouse. More information about the methodology behind the data compilation is available on the ECB’s website.